Tonsils are a pair of organs located at the back of the mouth. They prevent pathogens from entering the respiratory tract by trapping them. So, tonsils are a part of the body’s defense mechanism. Sometimes these tonsils get infected by the pathogens they trap and this causes them to get inflamed. This leads to sore throat and pain when you swallow anything. Usually school children are affected, but it may occur in adults also. When it becomes acute, one suffers from chronic tonsillitis. Then it becomes necessary to remove them surgically. 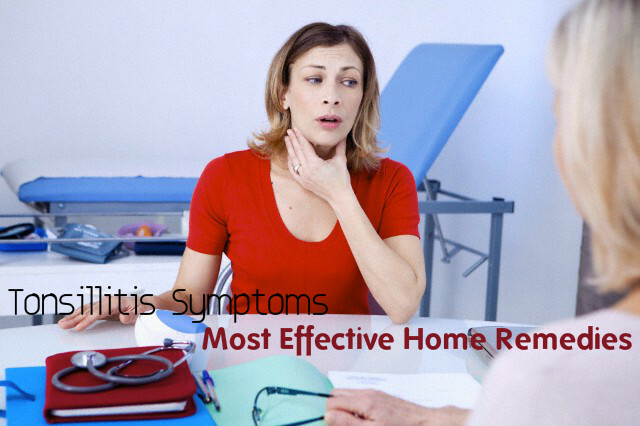 So, if you have painful tonsils, the best way is to follow home remedies, so that no medical treatment is required. Take some apple cider vinegar and dilute it with warm water. Gargling with this liquid will reduce swelling and the pain. It also helps in reducing the infection. Alum is a good disinfectant and is effective for getting you relief from swelling. It also prevents the infection from getting worse. Crush alum and apply it directly on your tonsils or you can dissolve it in some warm water and gargle with it. This is a resin like substances collected by honeybees. You get it in the form of tincture or spray. Spray it directly on the tonsils and the surrounding area, or if you are using the tincture, mix a few drops of it with some water and gargle with it many times. This will help in providing you relief from the pain and makes the healing process fast. Take the juice of cucumber and beetroot in equal quantities and add fresh carrot juice to it. Drink this juice everyday till you get relief from infection. Having a cup of herbal tea is always good for your throat when you suffer from tonsillitis. Cover the pot and brew the tea, so that no essential oils are lost. You can add some honey and lime juice. Chamomile helps in reducing the pain, while honey helps in clearing the infection with its antiseptic properties. Boil half a liter of water with 2 tablespoons of fenugreek seeds, and once it starts boiling, simmer it for about 30 minutes. strain it and gargle with this water several times a day. The antibacterial properties of fenugreek seeds help in getting rid of bacteria from the tonsils. Make a paste of fresh figs by boiling them and the grinding them. Apply this paste on your tonsils. This will provide you relief from the pain and also reduce redness and soreness of the tonsils. Take two tablespoons of fresh ginger juice and add 1 tablespoon of honey and 2 tablespoons of warm water to it. Gargle with this mixture to get relief from the pain and swelling caused by tonsillitis. Ice creams and popsicles can ease itching and pain temporarily and thus make you feel better. The cold numbs the tonsils for some time and provides you relief. Slice a lemon and take one half of the lemon. Sprinkle salt and ground black pepper powder on it. Let the salt and pepper get in to the lemon piece with a spoon and then hold it over a flame with the help of tongs. Lick the lemon piece till no juice is left. This is an effective remedy for tonsillitis. Squeeze out the juice of a lime into a glass of warm water. Add a pinch of salt and a tablespoon of honey to this water. Sip this several times a day. This will provide you relief from pain and the discomfort. Vitamin C in lime juice helps in increasing your immunity. Sipping mint tea several times a day is good for getting you relief from the pain. You may add a tablespoon of honey to the tea. The antibacterial properties of honey will fight against the infection. Grind mustard seeds to get its powder ad mix it with a glass of hot water. Gargle with this and it will help you cleanse your mouth, removing all the germs that have accumulated on the surface of the tonsils. This makes the healing process faster. Boil one glass of milk and add a pinch of turmeric powder and black pepper powder to it. Drink this milk at night, before you go to sleep. Do this for three consecutive nights and you will get relief from the symptoms of tonsillitis. Add two teaspoons of onion juice with one glass of lukewarm water and gargle with this several times a day. When you suffer from tonsillitis, salt water gargle is the best way to sooth your throat. Take a glass of hot water and dissolve a teaspoon of salt in it. Gargle with this salt water. This will prevent the infection on the tonsils from getting worse by cleansing your mouth. When you have tonsillitis, it becomes painful to eat and swallow. So you can have chicken or vegetable soup. This will provide you with the essential nutrients you require and helps in boosting your immune system. The steam from the soup can provide you relief from the nasal congestion. Burn the twigs of water hyacinth till they become ash. Mix some mustard oil to it and apply it on your tonsils. This helps in reducing swelling and inflammation. If your tonsillitis does not get better even after a week of using home remedies, then you must consult your doctor and follow his advice.